I bet I'd have a hard time finding a journalist who wouldn't have a soft spot for Samuel Fuller's Park Row, a paean to newspapers that reaches an almost propagandistic level of fervor. Before becoming a filmmaker, Fuller worked as a journalist, and Park Row is smeared with the press ink of authenticity. It's an undeniably personal film, and the energy that lends the film helps it overcome its occasional cornball moments. Using a mostly unknown cast, working on a shoestring budget, Fuller tells the tale of Phineas Mitchell (Gene Evans), reporter for The Star, one of the many competing newspapers on New York's Park Row. He's depressed about the state of journalism and the sensationalist tactics of his own paper, which he feels secured the execution of an innocent man. While bemoaning the state of things with his colleagues and drinking buddies, the prim publisher of The Star, Charity Hackett (Mary Welch), walks in, hears their complaints and fires the lot of them immediately. 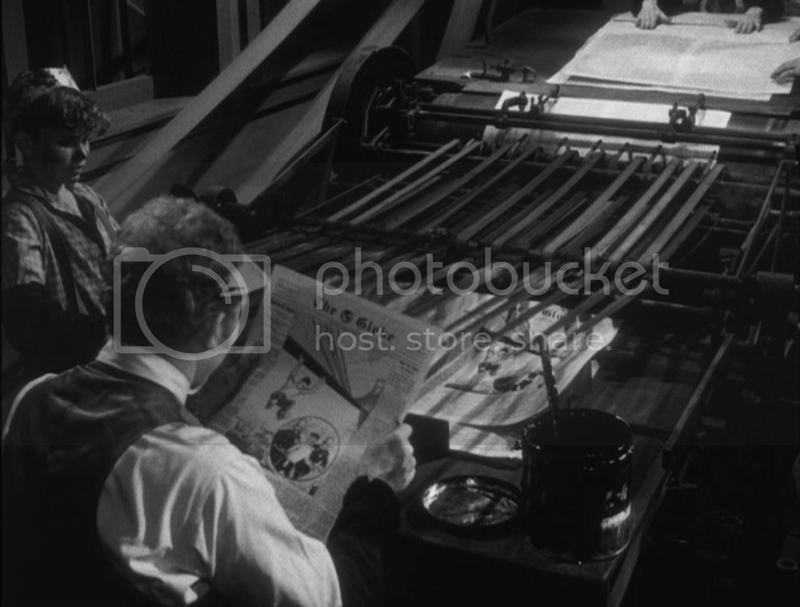 Phineas sees an opportunity to become the editor of his own newspaper, which he starts with an old-time reporter (Herbert Heyes) and the eventual inventor of the linotype machine, Ottmar Mergenthaler (Bela Kovacs), and calls it The Globe. When a man jumps off the Brooklyn Bridge and survives, The Globe has a hot lead story and the paper's upstart popularity enrages Charity, who pulls out all the stops in a down-and-dirty circulation war. Despite his disgust for her moral principles, Phineas finds himself falling for Charity, but fortunately, Fuller pays lip service to the romantic elements without fully embracing them, as they're pretty miscalculated in the grand scheme of things. Park Row has lots of nostalgia for old newspaper conventions and standard journalist speak. We're about as many years removed from the film now as Fuller was from the time period he depicts in the film, but I've seen that unabashed love for the newspaper industry live on strong in many a journalist of today. I think a lot of us secretly wish we could be crusty old newspapermen in the glory days of print, and the film satisfies that feeling with an insider's understanding. The film also finds Fuller working outside of Hollywood convention, allowing for moments of intense violence and showing a willingness to move the camera with several tracking shots that approach handheld levels of energy. Park Row is a lot more genial than some of the hard-nosed pulp that Fuller would later become famous for, but even in its moments of idealism and sentimentality, it remains a thrilling foray into the world of journalism. The MGM burn-on-demand disc represents the first time the film has ever been released on DVD anywhere, and the transfer looks solid, with strong grayscale separation and nicely contrasted black and white levels. The print used is overall in good shape, although there are a number of shots (often when cutting from a medium shot to a close-up) where the image quality is a bit degraded and almost looks like it was sourced from another print altogether. The mono audio avoids any major hissing or noise issues. The original theatrical trailer is also included.